Generally, transportation is provided for children to and from our Head Start centers. However, in order for the program to be in compliance with federal Head Start regulations, it may not be possible to offer transportation to all children. Route boundaries must be set to limit each bus route to one hour. Therefore, there may be some outlying areas or communities where transportation cannot be provided. In most instances, an approved pick up point can be arranged if you live in an area where transportation will not be provided. Head Start drivers comply with Wisconsin Department of Transportation regulations. Head Start takes the responsibility of transportation very seriously and requests full cooperation in following our bus procedures and policies. The children’s safety is the main concern and responsibility of the bus drivers and bus aides. 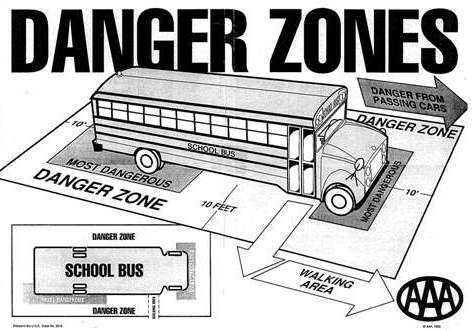 The Danger Zone is the area on all sides of the bus where children are in the most danger of being hit. Children should stay 10 feet away from the bus (or as far away as they can) and never go behind it.